We have taken the energies that we have been receiving from all of you, and we have noticed that what you are primarily doing at this time is releasing that which no longer serves you. We are capable of seeing what is entering and exiting your energy fields, and we are also able to receive the requests that you make, and so we know that in this phase of the human consciousness evolution, there is more of a desire to let go than there is to create. And that is normal and natural. It is perfectly wonderful in fact that you go through these cycles as a collective, as well as your own personal cycles. 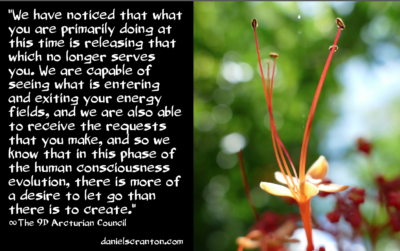 So then what does it mean to be going through a phase of releasing, purging, letting go of what no longer serves you? It means that you are becoming more aware of your thoughts, beliefs, emotions, patterns of behavior, and everything else that you experience, and you are taking note of what serves you and what does not. You are able to make decisions about what you want to continue to create with and what you want to release. To put it quite bluntly, you are taking out the trash, but we also can see that the majority of you are doing this without judgment. So even though we just referred to it as trash, we can see that you are able to for the most part lovingly let go of the lower frequency thoughts, words and actions that have been hindering you and holding you back. It is just time for all of you to start playing with new toys. It is time for you to make advancements in your lives, in your consciousness, and as a collective. You can see, if you look at the biggest possible picture, the way that humanity is progressing. You can see that even though there are those who will always resist, there are more of you than ever who want to purge as a collective as well. There are more of you now that want peace, equality, and respect for all humans, for all life forms. So what you are also doing at this time is letting in higher frequency ideas and approaches to life on planet Earth, and we could not be prouder.